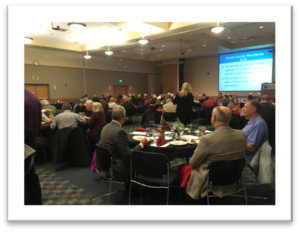 The Grant County Economic Development Council held the 2019 Annual Banquet on March 7, 2019. 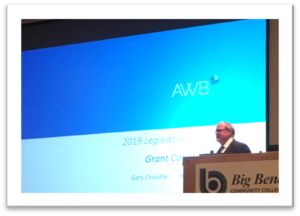 Gary Chandler, Vice President, Government Affairs with the Association of Washington Business, was the keynote speaker. Chandler gave a Washington State legislative update to a crowd of about 120 attendees. He reported that the Washington Senate and House of Representatives was balanced in 2018; the 2019 make-up is much less so. The state legislature is leaning heavily towards the democrats, which has seen an uptick in legislation that is not as favorable to Eastern Washington. Many of these bills have already been voted out, but there are some that warrant a continued watch. handler is very proud of and has been working on for many years is House Bill 5548, Multiple Pathways. This bill would emphasize more pathways to employment than the traditional college pathway from high school. Grant County is home to many different industries, which require many different types of skilled workers. This house bill would help to create more apprenticeships in Washington, which is needed by local industry. The GCEDC would like to thank those that were able to make the 2019 Annual Banquet. It is because of our investors that we are able to see such progress in our area. We can not wait to see what 2019 will bring for us.